Epices de Cru Spice Set and Book for sale. Buy online at Zingerman's Mail Order. Gourmet Gifts. Food Gifts. First you’ll be struck by how they look. Over two dozen matte metal tins, transluscent tops, each filled with a shock of spice. When you unwrap it, the aroma follows: floral, toasty, bright, rich, herbal, earthy, all swimming together. What really steals the show, though, is the taste. Ethne and Philippe de Vienne’s Montreal-based spice business Epices de Cru has what I think are hands-down the best spices around. Their house blends are unparalleled. 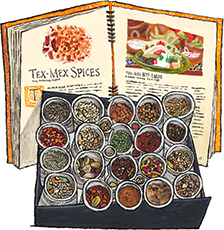 This kit has 26 spice combos, enough to keep a curious cook busy for months. It comes with a full book featuring sixty of their well-tested recipes. Makes a stunning gift. Note the spices are whole, which makes them last much longer. They only need a quick grind with a mortar and pestle or food processor. They will boost the flavor of your cooking tenfold.